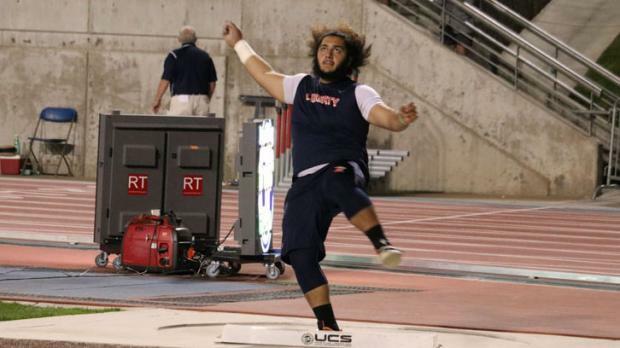 Let's take one final look at the top boys dual throwers in CA during the 2018 track & field season. The ranking order is based off of the first category (discus throw). Leaders in the shot put who may not have a huge discus throw, will be down the list. State Meet shot champion Daniel Viveros (pictured) is an example of that. He ranks 10th in the discus throw, thus is 10th in this list. There are six boys on this list with a shot mark of 60 feet or farther. Four of those are among the top 11 in the discus: Carlos Aviles, Harrison Gould, Viveros and Jeff Duensing. The other two are well down the list. Silas Hurst slots at #35 and Noah Holm at #98. Of note: Five of the top 11 will return for 2019: Avilas, Christian Johnson, Gino Cruz, Viveros and Duensing.